Fruit mince tarts are everything Christmas should smell and taste of. The spicy fruit center combined with the short crust pastry is our idea of Christmas heaven. 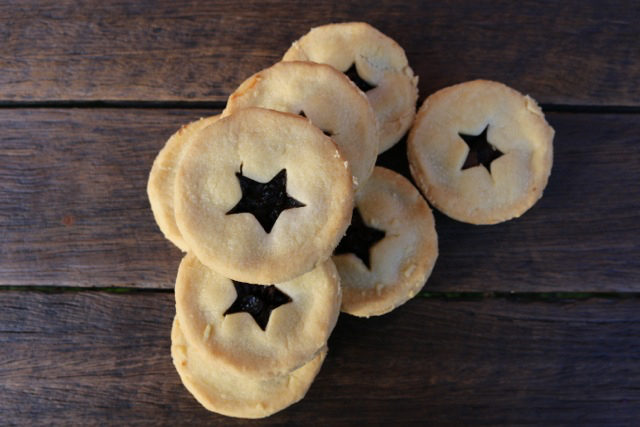 We’re using the fruit mince recipe we posted today to make these tarts, you can find it in our “Inspiration” section. Pour flour and sugar into the base of your food processor with the blade attachment fitted. Add the cubes of butter and blitz the mixture until you have a sandy crumb. Add the egg yolks and blitz again until the mixture turns into a smooth dough. Remove the dough from the food processor and wrap it in cling wrap. refrigerate the pastry for 30 minutes. Remove the pastry from the fridge and roll it out on a heavily floured surface until it is ½ cm thick. Cut out circles of dough with a cookie cutter and press them into the muffin holes in a small greased muffin tray. Spoon fruit mince into each pastry case, leaving just enough room for a pastry lid. Use a start cutter or another circle cutter to cut out lids or tops for your tarts. Pinch the edges of the tart together with the lid. bake the tarts for 30-35 minutes until golden all over. Pour flour and sugar into the base of your food processor with the blade attachment fitted. Add the cubes of butter and blitz the mixture until you have a sandy crumb. Add the egg yolks and blitz again until the mixture turns into a smooth dough. Remove the dough from the food processor and wrap it in cling wrap. refrigerate the pastry for 30 minutes.